It's National Hot Tea Month. Hot tea has been a popular beverage for hundred's of years. Although we think of tea as coming from China to England, it actually is the Dutch we can thank for bringing tea to Europe and later America. In the 1600's, Holland and Portugal were politically affiliated. The Portuguese would ship tea to Lisbon, and from there the excellent Dutch navy would transport the tea to France, Holland, and the Baltic counties. Eventually it's popularity made it's way to England as well. During this time, tea was very expensive. Being a lucrative commodity, the Dutch established many tea plantations in Indonesia where they grew tea for commerce. It was not unusual for it to cost more than $100 per pound. Only the wealthy could indulge in this amber liquid. The Dutch capital, the Hague, became a fashionable center for tea consumption. As imports increased, tea prices fell slowly. Eventually it was made available in shops throughout Holland. Dutch culture endorsed the consumption of tea with some controversy. Physicians and academics debated over the merits and detriments of tea consumption, but the populace mostly ignored them and consumed tea in great quantities. The first known coupling of milk with tea has been traced to 1680 when Marie de Rabutin-Chantal, the Marquise de Seven first mentioned it. About this time restaurants started serving tea to guests, some of them even providing personal tea service with warmers so guests could prepare their own tea out in the establishment's garden. The Dutch were key in trading tea throughout the West. American joined the tea craze about 1650 when Peter Stuyvesant brought the first tea to the colonists in New Netherlands (what is now known as New York). Americans took to tea so well that before long the small settlement in New York was consuming more tea than all of England! Of course, a few years later the Boston Tea Party changed all of that. So, although we may think of tea as an English beverage, I think we need to thank the Dutch for establishing tea as a part of mainstream Western culture. Amsterdam, the capital of the Netherlands is a large but nice city. My DH once lives there and now we are living in the bottom of the Netherlands. I think I must have missed the first because this seems new to me. Did not know the role that the Dutch played in bringing tea to Britain, Europe, and the New World. They knew a great thing when they tasted it. We had tea again last evening with dessert...an herbal vanilla nut with chamomille. Lovely. Carin, you live in a beautiful country. Our son and his wife chose it as the destination for their honeymoon and they loved it! Vee, your herbal vanilla nut tea with chamomile sounds so delicious! 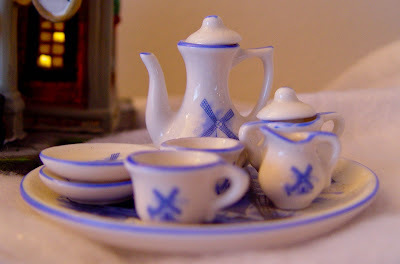 What a cute miniature teaset too. Thanks for the history. I finished a cute pillow top this week. I posted it on my blog. I have been hearing about all the snow your way.